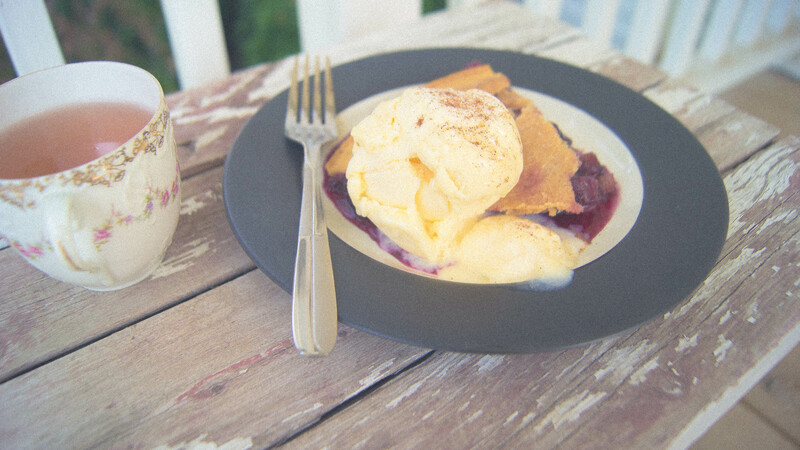 Goodness Gracious GREAT Grandma’s Rhubarb Berry Pie! Hi again! Sorry it’s been awhile. We’ve had many a cloudy and rainy day lately, so due to the weather not permitting enough good light to take photos near the window, I had to wait. Thanks for your patience! One of my favorite things is to reminisce. I remember going to my great grandma’s house when I was a child, and picking rhubarb in her backyard and pretending the giant leaves were “rabbit umbrellas”. I’m not so certain that my great grandma was much of a baker, but she did inspire me to see the beauty in all things, especially a rhubarb plant! 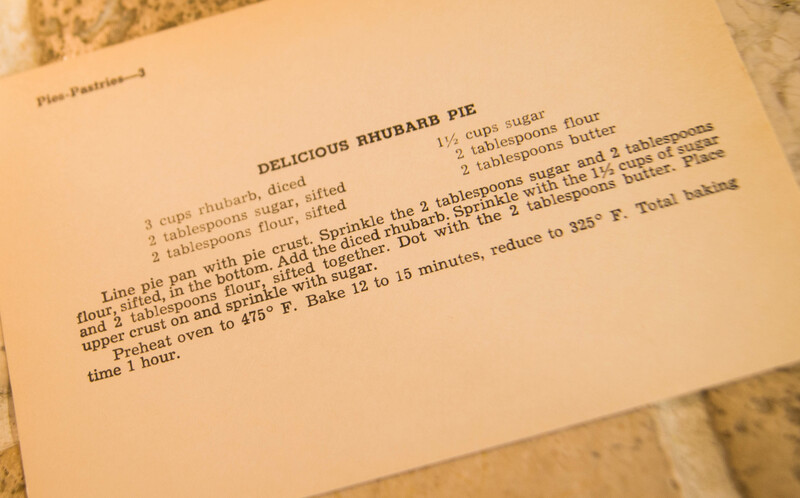 The reason I found this recipe is because my family was holding an estate sale at my great grandma’s house after she and other family members had passed away. 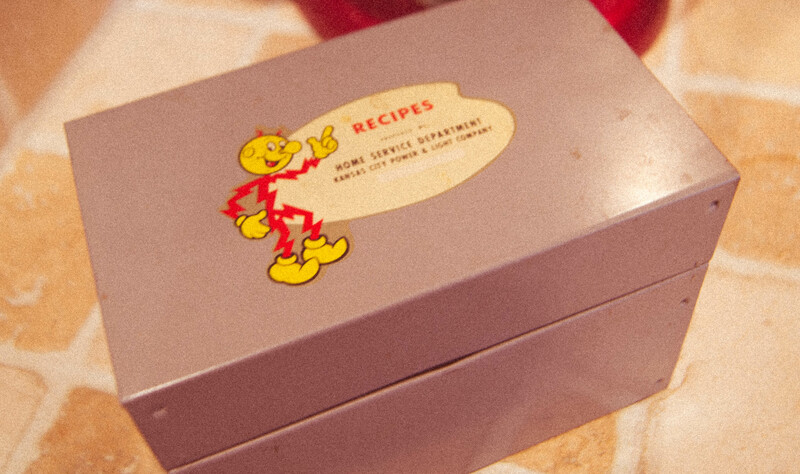 This recipe box held a mix of her recipes and some from the oven manufacturer, lol! 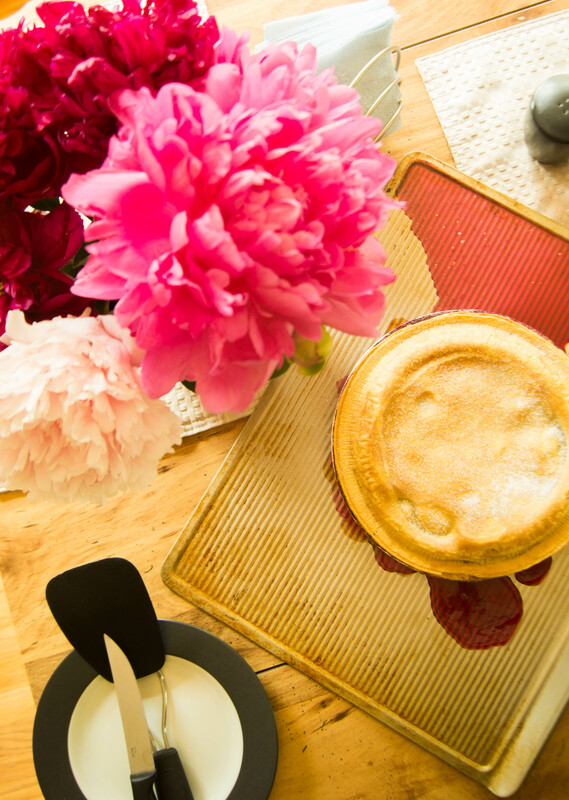 This very simple rhubarb pie recipe caught my eye and I decided to dress it up a little with some additional berries. If you’ve never eaten rhubarb, to me it’s a combination of bitter and sweet. Especially if you compliment it with lots of butter and sugar 😉 Also, like I mentioned above, it can be combined with other types of fruit so you find what you like, and use it ! First of all, I cheated and had two Pillsbury frozen pie crusts that I pulled out for this last minute recipe. 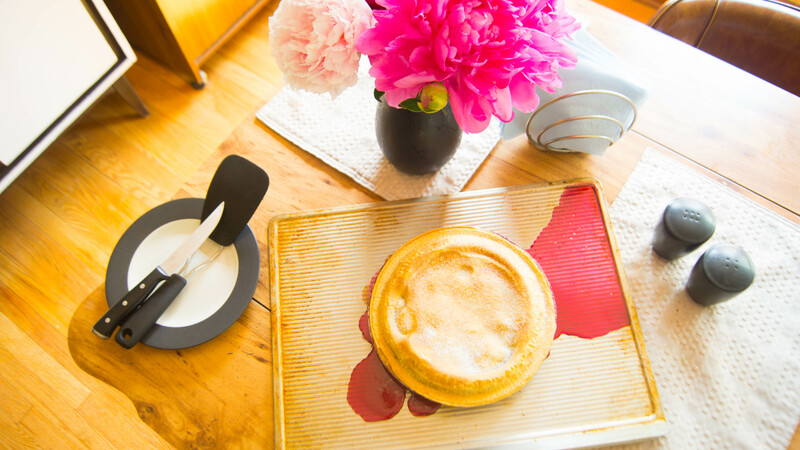 You can certainly use your own pie crust recipe, but for the sake of time I used pre-made. Also, you can use frozen rhubarb (when you can find it) but since it’s in season right now, my very nice neighbor gave me a few stalks, which meant that I later also brought her a slice of pie. I plan on planting my own “rabbit umbrella” plant in my backyard next year. 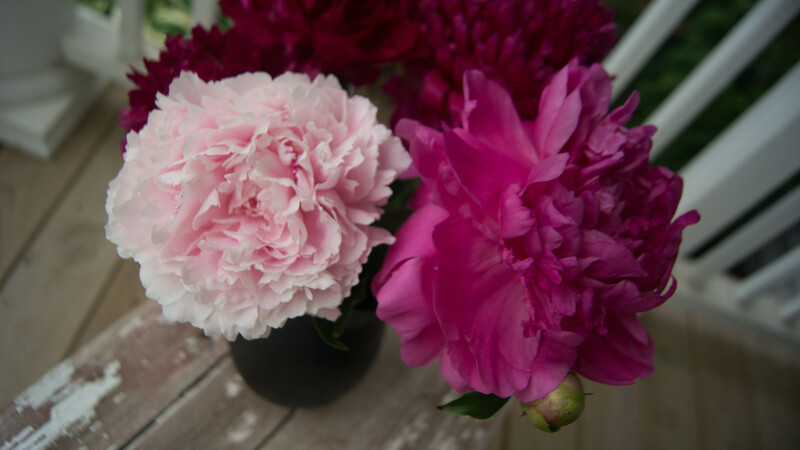 The other thing that’s in season right now is Peonies. Mmmm again, fresh from my neighbor’s garden. Thanks Joyce! To begin, I preheated the oven to 475º F. As you will see in the actual recipe, that the heat gets reduced later for a more “low and slow” style of baking. If you wish to cover the edges of the pie crust with tin foil after the initial blast of heat, you may, although I’ve never had any problems with burning. It may just depend on your oven! Now here’s a few tips to get you started. 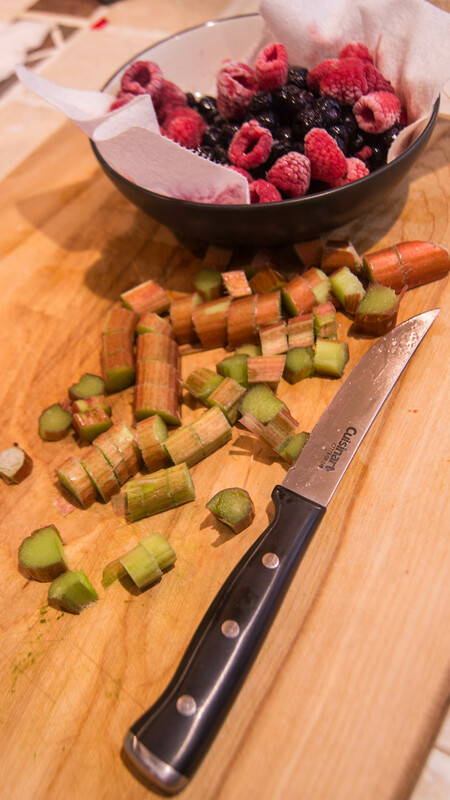 Dice up the rhubarb into about 1/2 ” pieces while the oven is pre-heating. 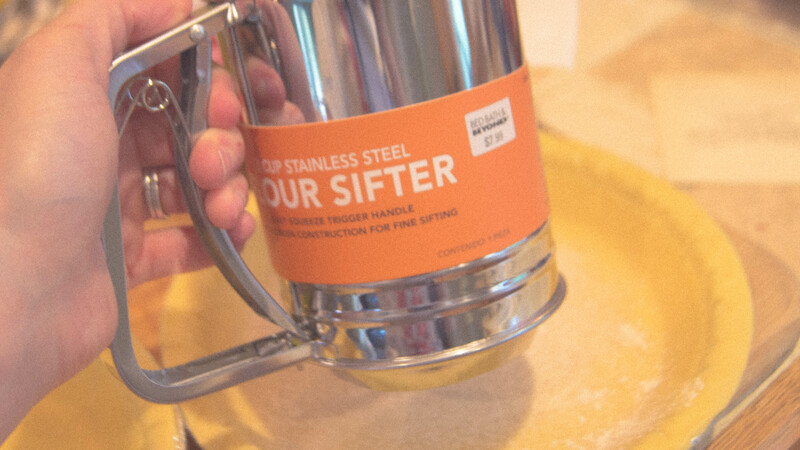 And I recommend using a real sifter to meld together the sugar and flour. If you don’t have one, look for one at your local grocery or wherever. As you can see, I got mine at Bed, Bath & Beyond for a rather low price, although you’d be surprised if you go thrifting what you may find at the Goodwill as well. 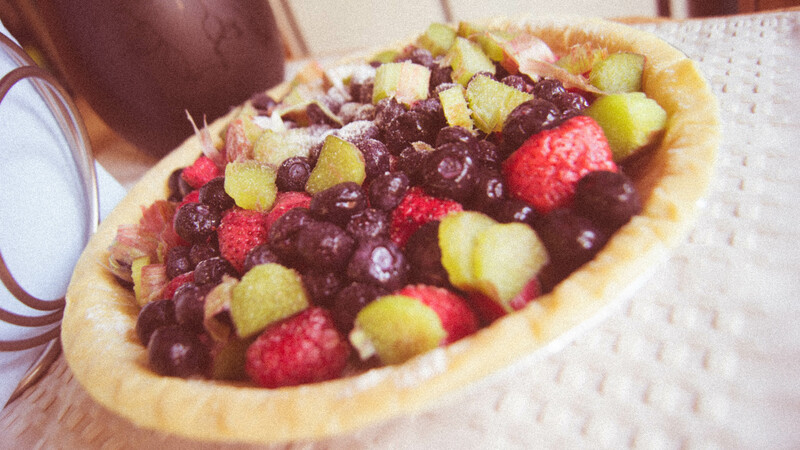 The first time I baked this pie, I used fresh berries. I have also used frozen. This time I used a combo. I’m not sure if this is true, but it seems the frozen ones melt of the ice quickly due to the high heat and leave a very watery pie. (SCIENCE!). Yeah, but anyway, You will see what happened as a result of this later. Now, when the recipe says to “dot” the pie with butter, just in case you don’t know what that means, it’s just a way to describe arranging multiple slices of butter around the entire pie. I recommend using cold butter in order to slice it evenly. As I mentioned earlier, I don’t know if you’ll have this issue or not. 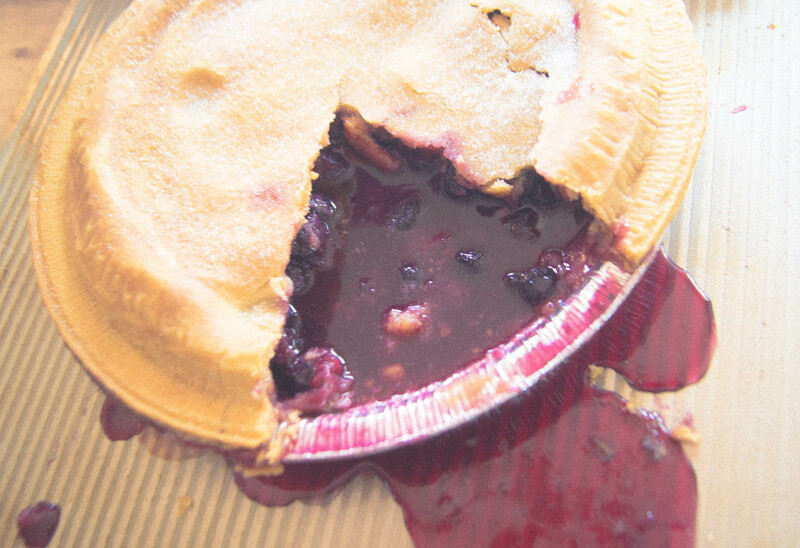 And perhaps I just filled mine too high– but I always recommend putting a baking sheet underneath your pie tin to matter what the chances of leaking are. I know this recipe hasn’t always leaked on me, but the first time I made it, I learned my lesson the hard way by getting cozy with some oven cleaner. 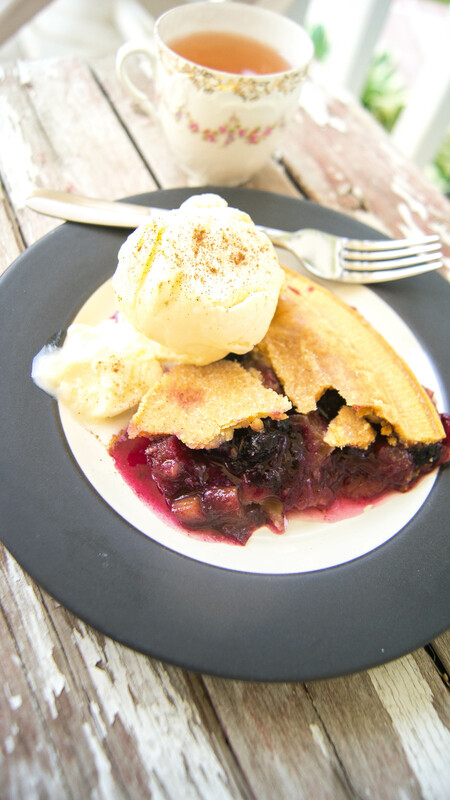 Also– the frozen vs. fresh berry thing– no hard and fast rule, but the recipe card does not mention this small detail: Do not fill your pie up past the level of the crust. OOPS! Oh well, it made for a very interesting and pretty picture to say the least. It matches the peonies right!? The only thing I was concerned about, however, was making sure the pie TASTED good, (well, and looked good) so I call it a success. Ultimately, it tasted best right out of the oven, (after having cooled for about 30 minutes of course) and served ala mode with some vanilla ice cream, a dash of cinnamon, and a spot of tea. Cheers!